US, 1990, 95 minutes, Colour. Eric Roberts, James Earl Jones, Red Buttons, Eric Braeden. 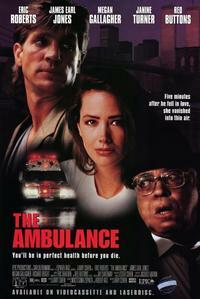 The Ambulance is a tongue-in-cheek New York thriller written and directed by Larry Cohen, responsible for so many tongue-in-cheek thrillers like the It's Alive series, Q the Winged Serpent, The Stuff, Special Effects... The film focuses on a cartoon artist, played somewhat over the top by Eric Roberts. However, this fits with the plot - as he pursues the girl of his dreams, as in a comic strip, has her collapse and disappear mysteriously in an ambulance. He is compelled to search for her. This leads to the police (with a comic strip, over-the-top performance by James Earl Jones before he is stabbed off halfway through). It leads him to a mad but suave doctor, Eric Braeden, in an effective guest role. There is a scheme for taking diabetics, implanting organs for human experimentation and their being sold to various hospitals on the east coast. The cover for this business is a swinging nightclub in Lower Manhattan. The film is like a comic strip with the chases, adventures, evil villains, brave heroes - and the comic touch of the newspaper reporter, effectively played by Red Buttons. There are chases, twists - and it is all rather tongue-in-cheek, not perhaps as profound as might have been expected with the theme. However, it is of a piece with Larry Cohen's films. 1. Entertaining New York thriller? Science fiction, science fact? Police investigation? 2. The work of Larry Cohen, his interest in genre movies, farfetched thrillers, spoofing the conventions? 3. New York settings, Manhattan, the workplaces, the police precincts, nightclub, hospital, the streets? The musical score? 4. The comic strip setting, the film as a variation on a comic strip? Accepting the happenings, the characterisations, their way of speaking etc? 5. Joshua Baker and his style, his being a comic strip writer, at work, the girl of his dreams, following Janine in the street, his carrying on, overdoing it - but giving credibility to what happens? Her collapse, his reaction, phoning the hospitals - and the humour of his being rejected? His concern, contact with the police? 6. Janine, being chased in the street, her reaction to Joshua, her collapse? Diabetes, the ambulance? The mysterious hospital, the encounter with the doctor, his sinister reaction, his explanation of what he was doing? The phone machine and her message to her girlfriend? The girlfriend trying to help - and her disappearance in the ambulance? The nurse on duty in the hospital? 7. The doctor, suave, his plan for making money, following the victims, their collapse, the ambulance men and sending in the ambulance? His cruelty, the experiments? Trying to take Joshua? Taking Elias, experimenting with pain? The finale, the ambulance, the chase through the streets, Joshua on the wall taunting the doctor, his crashing through into the building site? 8. Joshua as hero, at work, at home, with Spencer and their interchanges, with Sandy? Searching the hospitals? Being taken himself and collapsing? The encounters with Elias and the friendship? Getting out, finding the ambulance, taking the photos? Ringing the police and Elias's disappearance? Sandy and her concern? Going to see him? The pursuit of the ambulance? His being mugged in the slums after making the phone call? The ambulance coming and his egging the muggers on to bash the ambulance men? In the ambulance, loosening himself, getting himself out and going down the street? The escape, Central Park after the pursuit? The murder and the interrogation by the police? 9. The cover of the club, the registration of the ambulance? The chase and the fight with the ambulance men? The fight in the club, upstairs, finding Janine and the other patients (and her wanting Joshua to ring her boyfriend)? Joshua and his final pursuit of the doctor and luring him through the wall? 10. James Earl Jones as Spencer, his depression, his carry-on in the office, especially with Sandy? Suspicions, interactions with Joshua, at the hospital? The car-phone talk - and his being killed? 11. Elias, the newspaper background, talking in the hospital, snoring? His wanting the story, changing the clothes and his act in getting out of the hospital? Photographing the ambulance, taken, the doctor inflicting the pain? His getting free? 12. The ambulance men, sinister, their pursuit of Joshua? 13. Sandy, in uniform, out of uniform? Policewoman? Interrogations? Interrupting McCloskey? and the other policemen at their interrogation? Finding out about the club, going to the club, being pursued, dancing, firing the shots, causing the panic? Finding the victims? 14. The club, its style, the dancers, the cover for the ambulance and the fraud? 15. The tongue-in-cheek style? Police investigation, science fiction and science fact? Comic strip style?